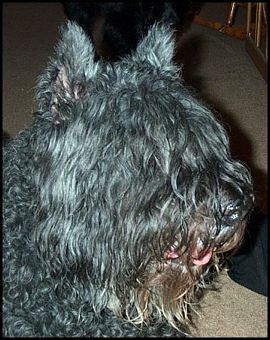 Sadie - our second Bouvier - Ch Mercedes Of Sunset II, our Bouvier ambasador. 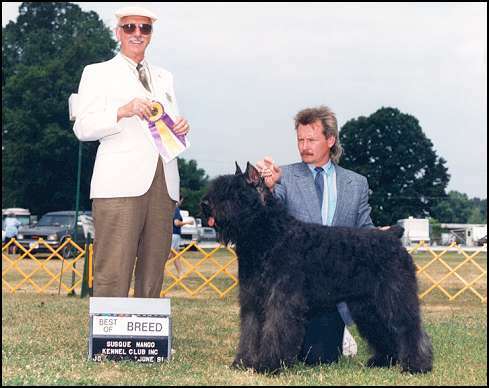 Sadie with Handler Gary Cooper winning Best of Breed in New York. 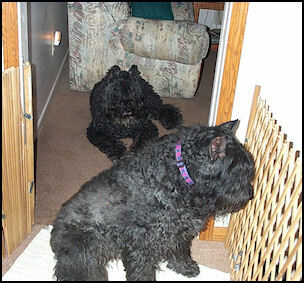 Sadie was our second Bouvier. She was much easier to raise than Tana. I always tell people she was born with manners. She was very much Daddy's girl. She loved being with Charlie while he was out working in the yard. She loved being the "farm dog". Although she spends most of the time inside with us she enjoyed being outside guarding the farm. She was very easy to train. She won two trophies while in obedience classes, being the first dog to earn a perfect score at the Beginner's level. She finished both her Companion Dog and Companion Dog Excellent with scores ranging from 194 to 198. She was trained for and could have earned her Utility Dog Title if it weren't for me owning too many dogs at that time. My training and show time was taken up by the other dogs. My fault, definitely not hers. 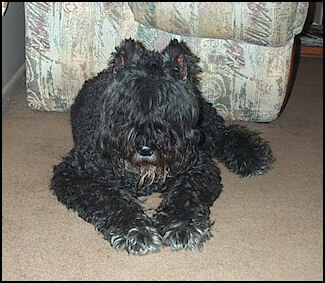 She earned the Well Rounded Bouvier plaque from our club, The Bouvier des Flandres Club of Southeast Michigan. Sadie was my steady girl. If anyone says they are afraid of big dogs, I always would give them Sadie to play with. I am a teacher and I often took Sadie to school with me. She is excellent with kids, as well as adults. She was very social and adored attention from others. Sadie was our singer. If you sang to her, she would sing along with you. The kids at school got a big kick out of Sadie singing. Sadie is probably responsible for me owning more than two Bouviers because she was such a joy. On March 12, 2001 we celebrated Sadie's life as we said our final good-byes. Sadie has been our Bouvier ambassador, showing guests in our home how wonderful the Bouvier is, visiting schools, and entertaining children. There will never be another Sadie. She will be greatly missed but will remain alive in our hearts and memories forever.